Developing successful methods of treatment requires a full understanding of the human being. This can not be achieved through observation with the outer senses only, but increasingly calls for spiritual-scientific perception. Through this method, as founded by Rudolf Steiner, great service can be rendered to humanity, including precise research into the causes of ill-health. The factors involved in the eruption of modern afflictions, such as dementia, can be determined by careful consideration of humanity’s – as well as the individual’s – destiny. 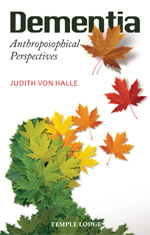 In this succinct but rich study, Judith von Halle describes her investigations into the phenomenon of dementia, beginning with a general outline of the anthroposophical conception of the human being and society, and applying that knowledge to what today is increasingly referred to as an epidemic. This book does not demand medical expertise, but requires an effort to engage with the psycho-spiritual conditions of dementia sufferers. It provides a wealth of insights and guidance to approaching one of the greatest challenges of our time. JUDITH VON HALLE, born in Berlin in 1972, attended school in Germany and the USA and subsequently studied architecture. She first encountered anthroposophy in 1997, and began working as a member of staff at Rudolf Steiner House in Berlin, where she also lectured. In addition she had her own architectural practice. In 2004 she received the stigmata, which transformed her life. Her first book was published in German in 2005, and she now works principally as a lecturer and author. She and her husband live in Berlin.